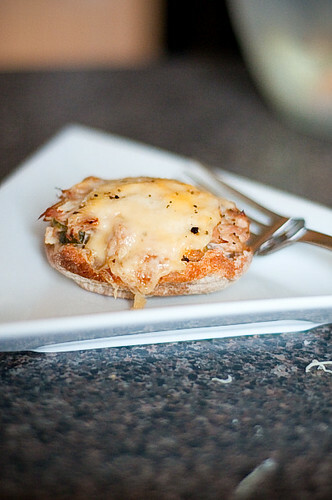 I may occasionally have the palate of a pre-schooler, but I just absolutely love tuna melts. It's one of my favourite treats to make - the perfect lunch for a rainy afternoon, or a quick easy dinner on a day when I don't feel like cooking. One of my favourite things about these sandwiches is they are super versatile and forgiving; you can make them work no matter what you have in the house. 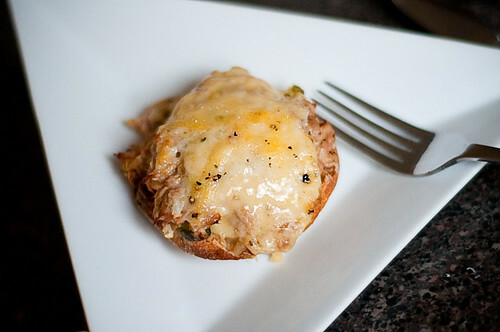 As long as you have bread + tuna + cheese, you can probably figure something out. I like to add some saltiness and crunch to mine, so I tend to put in whatever chopped up veggies I can wrangle up (in this case, gherkins and onion, on other cases, celery, green pepper, shallots, sundried tomatoes, capers). And last, you just need some sort of binding agent. I usually use a mixture of light miracle whip and dijon mustard, but I've done it with yogourt, sour cream and even a simple vinaigrette. So you really can always figure something out. You can whip these sandwiches together in about 10 minutes. Do it now, and thank me later. 1. 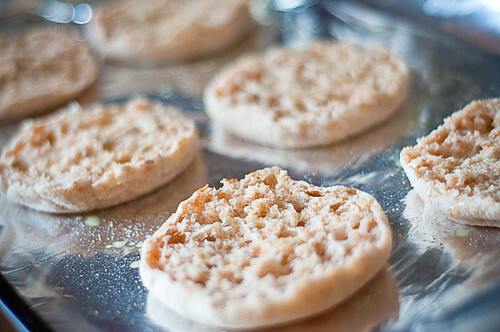 Spread your English muffins out on a foil-lined baking sheet (there will inevitably be cheese melting carnage...save yourself the scrubbing!). Preheat your broiler. 2. Toast the English muffins under the broiler (about 6 inches from the heat source) for 2 minutes or so. Keep a close watch on them! 3. 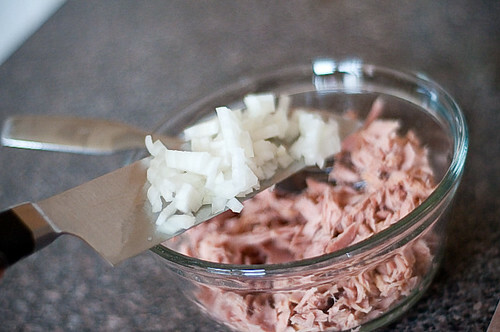 Meanwhile, combine the tuna salad ingredients. Taste - and season accordingly. If the mix is too dry to hold together, add a little more miracle whip/dijon. 4. 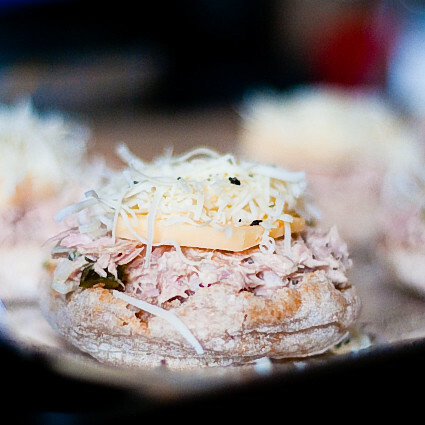 Top each toasted English muffin with tuna salad mix (I like to heap mine pretty generously, so two cans seems to be about perfect for six English muffin halves). 5. Top with cheese - I used slices of cheddar and grated parmesan. Any mix of grated/sliced would work. 6. Cook under broiler for 3-4 minutes (checking every minute) until cheese is nice and melted and slightly brown. Enjoy! OMNOMNOMNOMNOM. These are so yummy. 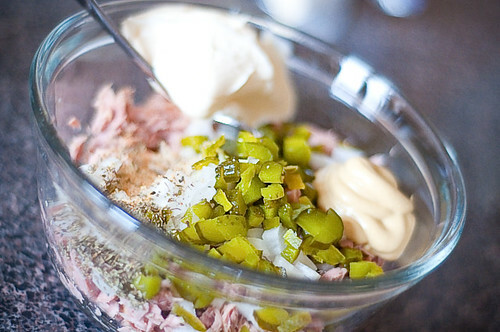 Very retro, very easy to make and just a fabulous lunch. 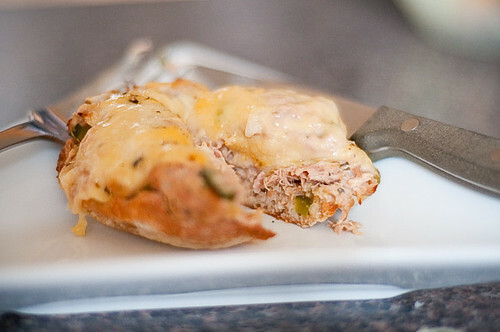 Tuna melts are probably my most favorite food. 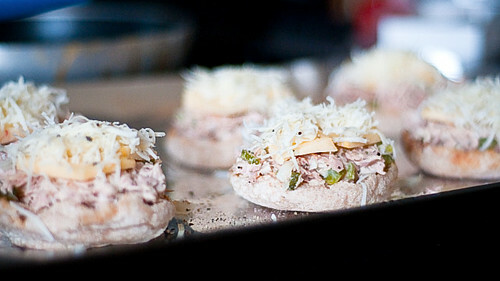 I make them using pita bread and I like a good balance of salty, tangy, crunchy. Yum. Love your blog! Here's an award for you!